More than 1,100 first-year students and nearly 800 transfer students will begin their SUNY New Paltz careers in the fall 2016 semester, marking another year of robust undergraduate enrollments at the College. Faculty, staff and fellow students will welcome new students to campus during the traditional Moving In Day on Aug. 25, and the formal Convocation ceremony on Aug. 26. 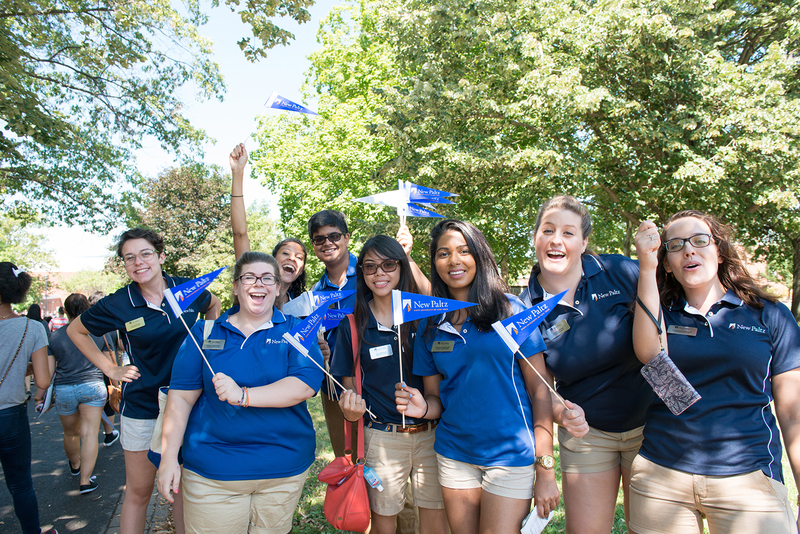 Eaton noted that this is the most diverse group of new students in the College’s history. The College’s international student population is growing with about 600 international students from 29 countries. A popular choice for students, New Paltz, for the 27th consecutive year, received more applications for undergraduate admission than any other SUNY comprehensive college, with 16,524 applications. The total renovation of Wooster Hall (formerly Wooster Science Building) is complete, and students, faculty and staff will be able to enjoy its spacious, modern layout and centralized services beginning this fall. The building was originally designed in a modernist style of architecture called Brutalism. Widely adopted during the period of cheap energy spanning the 1950s to 1970s, many governmental and university buildings were completed in this style. During that time there was a strong planning and design consensus that classrooms should have no windows/views to the exterior as they were a distraction from learning. As a result, classrooms were often located within the building interior and stepping of interior floor elevations would often create further separation of one function or room from another. Brutalist structures had very little or no exterior wall insulation and typically had only a single layer of glass in exterior windows. Over time, the freeze/thaw cycle dramatically degraded these exteriors and escalating energy prices rendered them obsolete or candidates for demolition. In addition, values and societal intentions for the built environment have changed dramatically over the past 40 years and there have been significant advances in building science and technology. As such, the renovation of Wooster saw the transformation of the 75,000-square-foot structure into an efficient, multi-purpose academic hub where students can meet with professors, engage with service staff and grab a bite to eat, all in one convenient campus location on the Old Main Quad. For example, new buildings reflect the goals of universal accessibility, advanced through the Americans with Disabilities Act in 1992, sustainability features of renewable energy and learning environments that incorporate views of nature and diffuse natural light. Many departments and offices have already been relocated to their new homes in Wooster Hall, including Records & Registration, Student Accounts and Academic Advising, creating a “one-stop shop” for students seeking various forms of administrative assistance. Wooster Hall also houses classrooms, laboratories, including four engineering labs, academic department offices, including Anthropology and Psychology, and a new 202-seat café. An official grand opening ceremony will be held in September. Details will be shared soon. The Wooster Hall renovation was conducted in accordance with state standards for energy efficiency, and it is anticipated that the building will qualify for a LEED Gold rating for design and operation from the U.S. Green Building Council. This fall students will be able to enroll in a new, 18-credit minor in digital design and fabrication. The program will serve students across all academic disciplines who wish to incorporate the principles of 3D design and printing into their course of study; this universal access to the College’s 3-D printing resources and expertise is a hallmark of the initiative. The new Career Exploration Community will debut in the fall 2016 semester to provide incoming students who have not declared a major with opportunities to identify personal skills and passions and find ways to translate them into a successful career both in and out of the classroom and through their residential experience in Esopus Hall. This is the fourth living/learning community to be developed as part of the successful Communities at New Paltz program, which offers living/learning experiences to first-year students seeking academic and community engagement in and out of the classroom. Enrollees will take a fall semester course led by Career Resource Center Assistant Director Dawn McCaw, which will focus on helping students identify and develop their professional interests and propensities. In the spring, they will capitalize on this work through experiential learning projects with various on-campus offices that align with their career ambitions.